Thermal Spray Grade Tungsten carbide cobalt is a ceramic-metal (cermet) composite material used as a wear resistant coating. The alloyed form gives superior hardness. 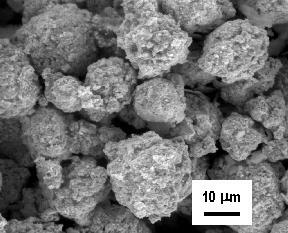 Infralloy™ powder is made from WC nanoparticles alloyed with a cobalt binding matrix phase. Infralloy™ Series S7400 powder is available as agglomerated particles with dimension 5 < F < 45 mm with high flowability for HVOF thermal spray applications. SEM micrograph typical of Infralloy™ S7412 feedstock powder showing spherical geometry with high flowability. 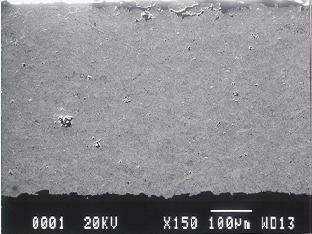 Cross sectional SEM view of a typical very dense carbide coating produced by a Metco HVOF gun using Infralloy™ S7412 feedstock powder. Pores (dark spots) occupy only ~ 1% volume. Inframat Infralloy™ S7400 Series powder is a superior coating material providing wear-, erosion-, and corrosion-resistant surfaces where excellent to exceptional fracture toughness is required. The Thermal Spray Grade material can be applied with DC Arc plasma and HVOF guns. Full spray specifications are available through Technical Applications Bulletins Nos. S7412.01B and S7417.01B.